As more people discover the wonders of tiny home living, some brilliant houses are taking form that balance stylish design with the efficiency of small spaces. Aaron Maret's "Pocket Shelter" is a perfect example of just how elegant a tiny house can be. This 200-square-foot home on wheels was built over a period of 5 years, and cost approximately $64,000 to construct. 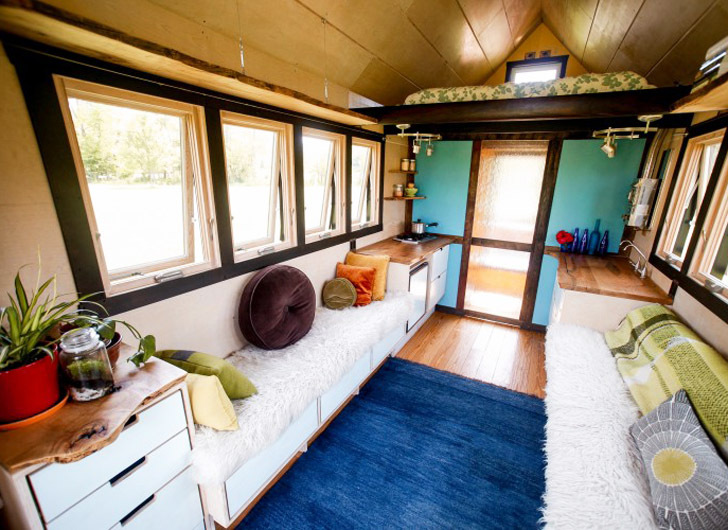 Since this residence is on wheels, it can easily be transported wherever the family desires, whether that's across the country for a summer adventure, or a little plot of land to set down some roots. Maret incorporated many recycled materials into his home’s structure, from the enormous reclaimed windows to the salvaged redwood that was used for the decking, and repurposed pine flooring. The main living space is flooded with light, and the bright paint hues that were chosen juxtapose gorgeously with the structure’s rustic aesthetic. Pillow-strewn benches line both walls, and the kitchenette area has living-edge wooden countertops and a small sink that transforms into additional counter space with the help of close-able flaps. A ladder provides access to the sleeping loft above, and a mini built-in composting toilet is enclosed in the washroom space below. The Pocket Shelter was completed in 2013, and although Maret had initially designed it as a prototype with the intent to create an entire series, he became so enamoured with the little house that he decided to move into it instead. His partner and young son moved in as well, and we can only imagine how much fun they’re having in this cheerful, minimalist cabin. Where's the bathroom and if there is one why couldn't we see it? Still I love it! I want this one! I have looked at hundreds and maybe more, but this one is me! Simple but with a blend of rustic, and spare modern lines. I love it! The living edge of the counter-tops are a great addition and helps the eye to smoothly move from rustic to modern- they tie in nicely. how can I become a green inspector for homes and or businesses with the goal being helping people to determine what would be the best methods for turning there homes or office spaces "green" . As more people discover the wonders of tiny home living, some brilliant houses are taking form that balance stylish design with the efficiency of small spaces. 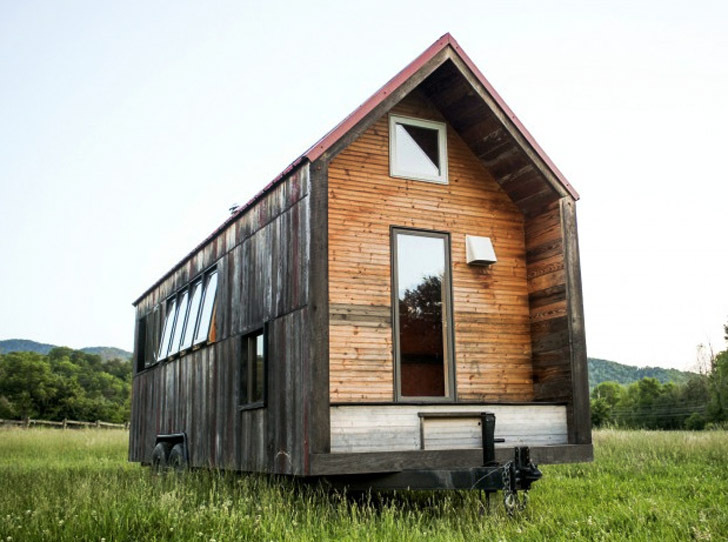 Aaron Maret's "Pocket Shelter" is a perfect example of just how elegant a tiny house can be. The interior is flooded with light from the reclaimed windows all around. The kitchenette sink transforms into additional counter space with a couple of wooden inserts. All countertops have living edges, adding to the home's rustic appeal. Storage space has been incorporated wherever possible to maintain the home's clean minimalism. Long benches line the inside walls, with plenty of cupboard space all around. A ladder provides access to the sleeping loft. A view of the Pocket Shelter's sleeping loft before furniture was added. The bright yellow maximizes light use, and is so very cheerful. Another view of the sleeping loft, now with a mattress added, and plenty of books within easy reach. Eco-friendly insulation was used between the reclaimed wood exterior and the interior frame. Reclaimed redwood was used for the decking. Since the home is on wheels, it can easily be moved to any location. Pocket Shelter combines a rustic aesthetic with modern sensibilities. Paring down and living minimally might seem daunting, but can be immensely rewarding, especially with the freedom that can come along with it.